ConceptDraw DIAGRAM software extended with Sport Field Plans Solution from the Building Plans Area is a perfect software for drawing professional looking playground layout of any complexity. Sport Field Plans Solution offers you wide variety of drawing tools and numerous collection of predesigned vector stencils grouped in the Sport Fields and Recreation Library. 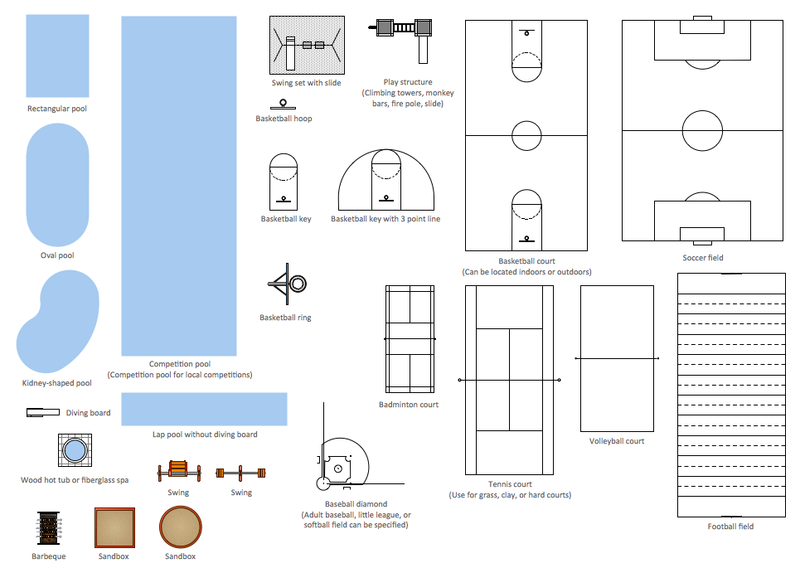 All these objects are available for using in the process of playground layout drawing. All what you need to do is simply drag the desired objects from the library to the document and arrange them according to your needs. 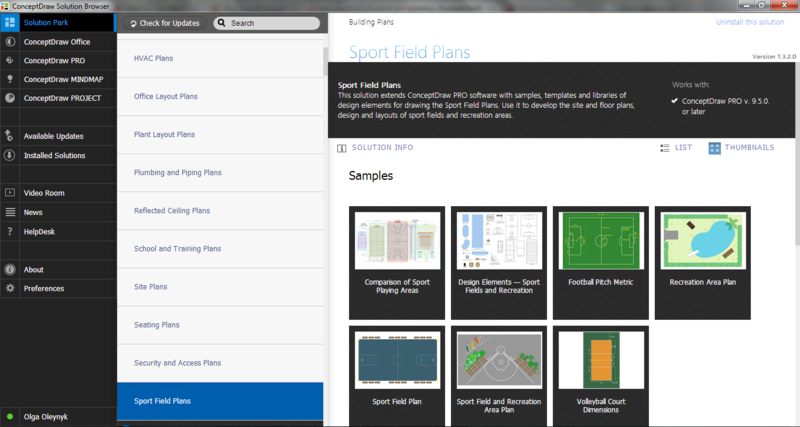 Pay also your attention for the set of professionally designed templates and samples included in Sport Field Plans Solution and available from ConceptDraw STORE. This sample was created in ConceptDraw DIAGRAM using the tools of Sport Field Plans Solution. 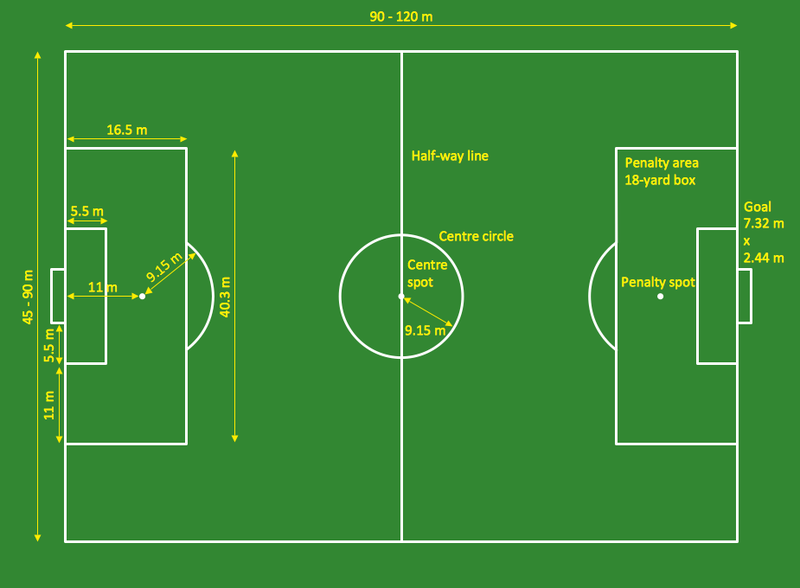 It shows the detailed plan of the football pitch with all dimensions. An experienced user spent 10 minutes creating this sample. 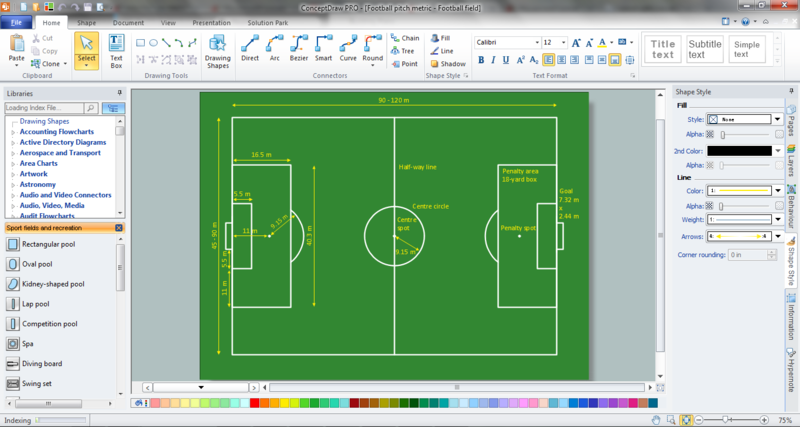 Use Sport Field Plans Solution for ConceptDraw DIAGRAM software to draw your own professional looking playground layout quick, easy and effective. Any playground layout designed with ConceptDraw DIAGRAM is vector graphic document and is available for reviewing, modifying, converting to a variety of formats (image, HTML, PDF file, MS PowerPoint Presentation, Adobe Flash or MS Visio), printing and send via e-mail in one moment. This template shows the restaurant floor plan for kids. The floor plans are necessary for architects, builders, designers. It’s very simple, convenient and quick to design the professional looking Floor Plans of any difficulty in ConceptDraw DIAGRAM v12 Use the ready-to-use predesigned objects, templates and samples from the Floor Plans Solution for ConceptDraw DIAGRAM v12 you can create your own Floor Plans quick and easy. You need quickly design Playground Layouts? Use the tools of Sport Field Plans solution from the Building Plans area of ConceptDraw Solution Park to depict any of your ideas for the Playground Layouts.